We are so proud Marsel van Oosten won the title Wildlife Photographer of the Year 2018! Congrats Marsel! With his image ‘The Golden Couple’ he won First Prize in the Animal Portraits category plus the grand title. Here’s some information from Marsel about his image and The Golden Couple monkeys. 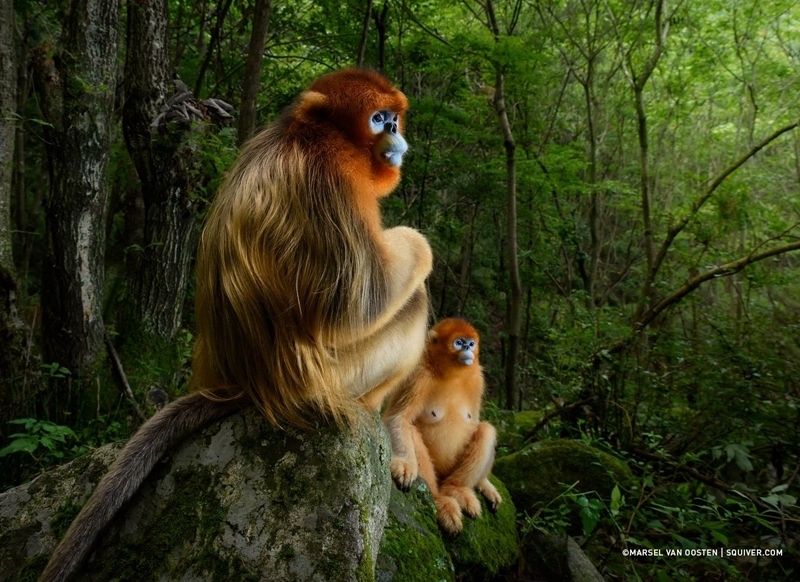 The image features two golden snub-nosed monkeys that Marsel photographed in south-west China. The Qinling golden snub-nosed monkey (Rhinopithecus roxellana qinlingensis) is an Old World monkey in the Colobinae subfamily. It is endemic to a small area in the temperate forests of the Qinling Mountains at elevations of 1,500-3,400 m above sea level. These beautiful animals are listed as Endangered by the IUCN as only some 3,800 individuals still exist. Most people have never seen these creatures, and awareness is a critical first step towards the successful conservation of any species. This is why Marsel thinks it is important to show these images to the world. Their main threat, as often, is habitat-loss. For instance, lichens are the main staple of the monkey’s diet and dead trees have the greatest lichen coverage. Unfortunately, dead trees are harvested, thus reducing the quality of the habitat and availability of food. The monkey is a highly selective feeder, so damage to its habitat seriously impacts the species. The males have large bodies covered with very long, golden guard hairs on their backs. Females are about half the size of the males, and their golden guard hairs are shorter. The golden snub-nosed monkey is found in groups ranging in size from 5-10 individuals to bands of about 600. The males often stay solitary, remaining away from the rest of the group members as they rest, but females or juveniles sometimes join them. With his beautiful photographs Marsel raises awareness for the most beautiful animals that are critically endangered. We are extremely proud he donated some of his wildlife head shots to us. Together we can be the change and make conservation of any species happen. Do you like to help increase awareness of the extremely rapid extinction rate of wild species? Join our pack. Shop your Lion, Tiger, Macaque, Panda, Rhino or Polar Bear shirt now. Save Wildlife. ← Have a beastly good summer.